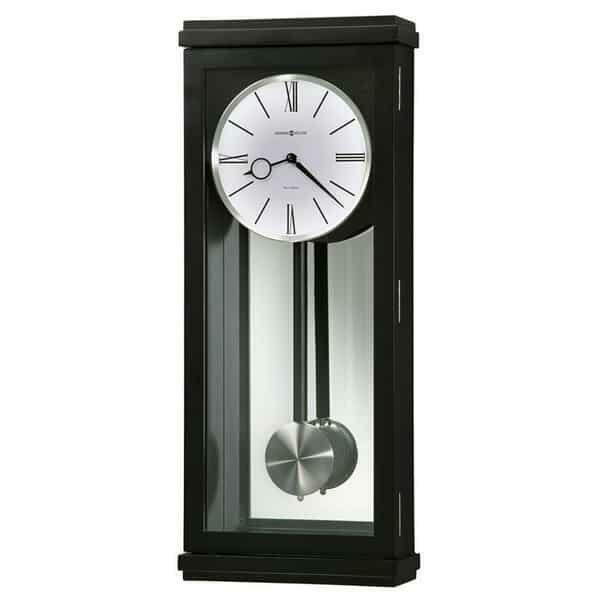 This wall clock features a white dial with black Roman numerals, a brushed nickel bezel and black hour and minute hands. A spun nickel pendulum bob is suspended on a Black Satin finished wood stick in front of a mirrored back. Quartz, triple chime Harmonic movement plays your choice of Westminster, Ave Maria, or Bim Bam chimes, with volume control and automatic nighttime chime shut-off option. Finished in Black Satin on select materials, hardwoods and veneers.